What does it mean to be a child? Specifically, what does it mean to be growing up, to be young, in this milieu? While set in the sepia of 1885, Peter and the Starcatcher by Pangdemonium asks questions that still resonate now, opening up to an extended session of make-believe to present the origin story of a Boy who detests all “grown-ups.” The story comes dusted in “starstuff,” a coveted substance that literally came from the stars, and has the magic to grant wishes. “Starstuff,” as we later learn, is also what transforms Peter Pan into an eternal child with the ability to fly. 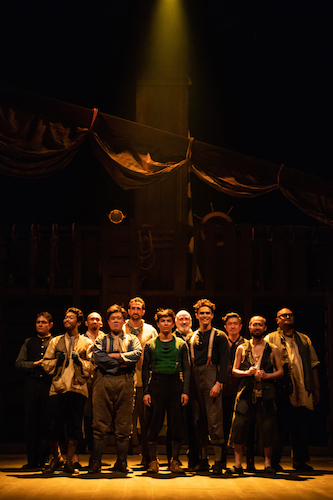 Peter and the Starcatcher originally opened at California’s La Jolla Playhouse in 2009, and this iteration by Pangdemonium traces the stories surrounding this magical substance in a pre-Peter Pan world as it ping-pongs between two rival ships travelling through 19th-century Southeast Asia. There are moments of gravity sprinkled throughout the play that demand we give them more thought, more time to linger, but these are only cursory as Starcatcher spirals into a relentless whirlpool of absurdism and borderline horrid puns. We are forced to move along to the next punchline and the next, and our attention is wrenched back to the stage. Starcatcher is chock full of content, with references ranging from the historical to political, to the whimsical and philosophical—a mention of Tanjong Pagar alongside almost tokenistic jibes at Singapore and our colonial history; the feminist movement and its commands of “Be a Woman!” alongside a budding love story between Boy (Thomas Pang) and Molly (Carina McWhinnie); and an attempt to map a fantastical world onto maritime Singapore with characters in tacky sea creature costumes converging on a certain Mount Sambal Belacan. 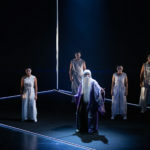 Despite being framed as a family-friendly production, the stage drowns with the breathlessness of its quickfire dialogue, and I am left grasping at what I can of the plot as a lifeline. I watch with sick fascination as the furry head of a mop becomes a grey cat, as Molly follows gruff seaman Alf (Crispian Chan) with great excitement to see “the pigs” on board the ship only to find out that they are stowaway orphans —with one of them, Ted (Andrew Marko), ironically developing a taste for pork. I watch and bear witness as objects discard their conventional meanings, such that anything can be anything, and bodies are treated as objects—in one sequence, Boy is momentarily reduced into a footstool for British naval captain Robert Falcon Scott (Zachary Ibrahim). There is something insidiously dark in each of these moments, yet at that instant of witnessing them I can only register a slight distaste in my mouth without being able to articulate why. The audience laughs, and I find myself chuckling along, uncertain of myself. What is the function of laughter, and what do we miss when we laugh? I allow myself an hour or so of thoughtlessness, and sure enough, Starcatcher leaves no room for me to pause and regather my thoughts. Laughter feels almost like an opioid, and I wonder what it is that Starcatcher is trying to distract us from. In the lightheartedness of theatre, we forget that laughter can sometimes be a poison, or more mildly put, a way to make reality more palatable. It does not provide a cure. Now is not a good time to be young— we are almost certainly hurtling towards an apocalypse. If not in our lifetime, then our children’s. The United Nations Intergovernmental Panel on Climate Change (IPCC) recently released a report that details how the damages of climate change is near impossible to reverse, and that we have reached the threshold of caution. There’s also the opinion that we currently exist in a doomed world, and to bring another life into this world is in fact unethical. After the entire ordeal, the three boys whom we’ve watched grow over the course of Starcatcher are now safe on an unknown island, but have no home to return to. They band together and eventually became the first Lost Boys. In a moment of vulnerability, Boy accuses Molly of “say[ing] sorry so easy,” but not actually doing anything to make things better. Are we the same in the way we laugh in the theatre, then go on to mill about our daily life? Fresh from the intermission, after learning about Boy’s traumatic past as an orphan, we are plunged underwater with a cabaret number of mermaids who were once ordinary fishes, made anew by “starstuff.” Our first reaction to the cast doused in candy-coloured glitter are neon bright peals of laughter. We laugh not only because the sight of an ensemble of almost all grown men (except for Molly) in mermaid costumes is ridiculous—but why is it ridiculous? Grown men can be mermaids too. We also laugh because it relieves the tension from our body. Tension from experiencing trauma, pain, personally or secondhand. It is almost as though we are only too eager to look elsewhere, to purge ourselves of the knowledge of another person’s suffering, using comedy as a diversion. But perhaps it is not only Boy’s trauma that we are eager to look away from. It is also the dark quiet possibility that we have been complicit in the times we have dismissed a child when they are trying to tell us something, that most of us are precisely the “grown-ups” that Boy abhors. That this reality we have here is inescapable. The face of laughter is at times indistinguishable from one contorted by pain. In Starcatcher, “starstuff” changes the nature of the wish-maker entirely in order to grant their wishes. “Starstuff” not only grants Boy’s wish to be “a boy for a little while,” it also gives him a name, the possibility of belonging somewhere rather than nowhere. 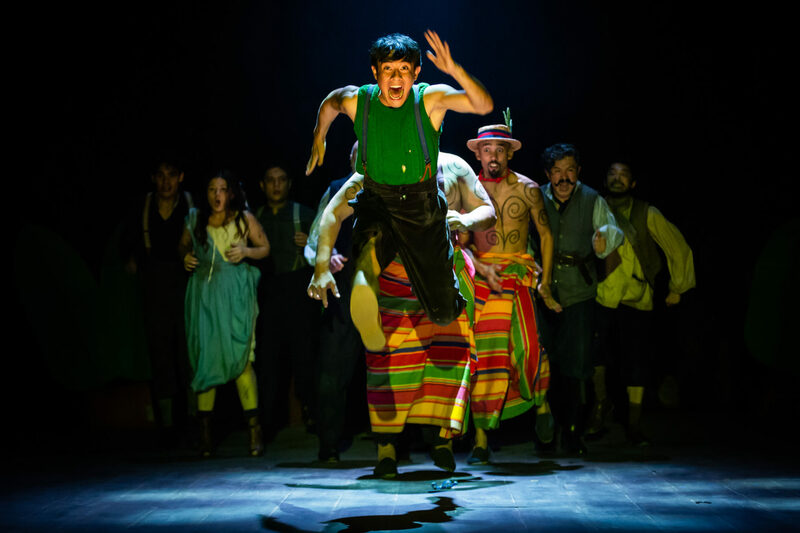 However, once Lord Leonard Aster (Daniel Jenkins) realises that Boy has become Peter Pan because of starstuff, he immediately pulls Molly, his daughter, away from Peter. Even a veteran starcatcher fears what starstuff can do to a person. Another name for starstuff is perhaps power, which on its own, is neither good or bad. It favours whoever has it without any inherent moral systems, but it does not always cure loneliness. “Now free, but alone,” whimpers Peter Pan, as he watches Molly leave. At the end, in a bid to convince Peter to stay on the island and let them leave without him, Lord Leonard Aster proposes a meaning behind Peter Pan’s last name, associating it with the Greek meaning of the word, “all,” claiming Peter’s home as everywhere. But the other face of everywhere is really nowhere, nomadic without anchor. At this moment, it is with especially bitter irony that “everywhere” does not include where Peter wants to be at the most: with Molly, his love. We stop laughing here, because we recognise the gravity and reality of separation. Starstuff’s response to Peter’s wish to be cared for, as a boy, is to suspend him forever on the cusp of adolescence. We learn from Molly, who remembers Peter as Boy, that he forgets the ordeals he faced and the pain of losing her by forgetting everything altogether. She does not have the luxury of forgetting or laughing it off, but maybe it is not a luxury at all: precisely because she remembers, she carries the warmth of her shared memories with Peter. To be a child in 2018 means to learn increasingly the hopelessness of future, relying on cheap shots of humour to confront the present. Perhaps this is the answer to the question that Starcatcher asks about what it means to grow up. To not divert our attentions elsewhere, but to remember, and to continue holding everything we’ve learnt in our hands—to become better together, despite pain and inevitable loss. 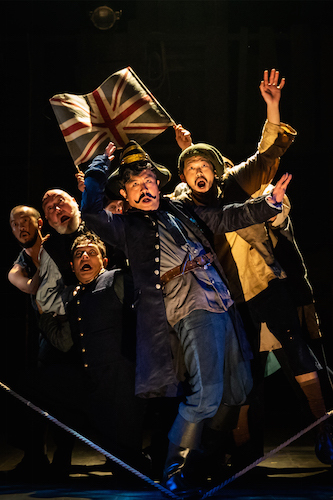 Peter and the Starcatcher by Pangdemonium was staged at the Drama Centre Theatre from 28 September to 20 October 2018. This review is based on the performance on 12 October 2018, 8pm. Teo Xiao Ting recently graduated from Yale-NUS College with a BA (Hons.) in Arts & Humanities, minoring in Psychology. She is currently a freelance writer, subeditor, and fact-checker. For more information about this human, visit her website. 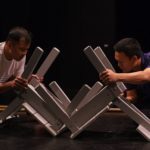 This review is part of the Performance Criticism Mentorship Programme with Corrie Tan, which is initiated by National Arts Council and organised by ArtsEquator. It is a six-month programme during which theatre critic and mentor Corrie Tan guides mentees Casidhe Ng and Teo Xiao Ting in reviewing one performance a month from September 2018 to March 2018. 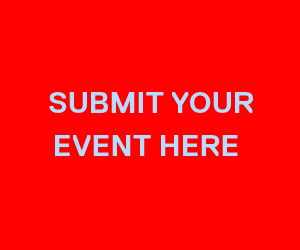 The program seeks to push the writers’ and the readers’ expectations of the forms and perspectives of critical writing, as a way to expand beyond the conventional shape and depth of criticism in Singapore.